Ben Ainslie led his Land Rover BAR team to victory at the Louis Vuitton America’s Cup World Series in Oman this weekend. Ainslie beat his former skipper, Jimmy Spithill and Oracle Team USA by two points, with the winning margin secured on a late charge in the final race. Ainslie says winning the event in Oman was an important measuring stick for his team, which hadn’t won since securing victory on home waters in Portsmouth last summer. For ORACLE TEAM USA the second place result was a fourth consecutive podium finish in a Louis Vuitton America’s Cup World Series regatta. But for all that, the team has yet to win. With a third place result in Oman, Emirates Team New Zealand retains its place atop the overall Louis Vuitton America’s Cup World Series leaderboard, but ORACLE TEAM USA, in second place, has closed the gap to just 6 points. Ashby is right. The leader at the conclusion of the Louis Vuitton America’s Cup World Series will carry two bonus points forward into the Louis Vuitton America’s Cup Qualifiers in May 2017 in Bermuda. The second place team earns one bonus point. 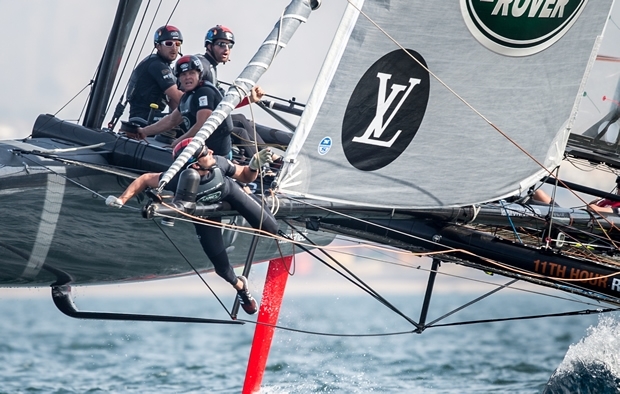 The Louis Vuitton America’s Cup World Series Oman marked the first America’s Cup sailing in the Middle East and was a milestone event for the host, Oman Sail. “This was a fantastic weekend for us,” said David Graham, the CEO of Oman Sail. “Promoting Oman through the America’s Cup broadcast was a fantastic opportunity for us. “It was also tremendous to see the integration of our youth sailing programs with AC Endeavour. And I think perhaps most significant for me was how the Omanis on our team led the charge and delivered a fantastic event.